To be transported, most products are placed on a pallet. Successful palletizing is essential to ensure the next step in the logistics process. To automate their palletizing process, manufacturers often use palletizers installed at the end of the line to ensure the automatic loading of products on the pallet. Palletizers complete the packaging line and help to save a lot of time on load palletizing. Several types of palletizers exist on the market, the industry is constantly innovating to manipulate different kinds of products such as cardboard boxes, bags, bottle packs, etc. Two large types of palletizers have emerged over the decades. To make the right choice of the most appropriate technology for their needs, manufacturers should review their requirements (versatility of line, rate, size ...) as well as the particularities of the load to palletize. What are the two main types of palletizers? In the case of layered palletizers, the preparation of the product layer precedes the palletization. Packages, joined by whole layers, are deposited on a tray whose opening allows their removal, layer by layer, on the pallet. * High-level layer palletizers are constructed in such a way that the wooden pallet receives the layers of parcels on the floor, then goes down as the layers are added. * Low-level layer palletizers are built so that the wooden pallet remains on the lower floor, and the layers of packages are mounted higher and higher. When the palletization plan requires insertion of interlayer sheets between the layers of packages to ensure their stability, a special gripper should be installed in the line. If you are using palletizing robots, then most of the line should be located on the ground floor. The palletizing robot is enclosed in a security zone to protect operators. ► Take the packages and place them on the pallet according to a defined palletizing plan. ► The robot can take the wooden or plastic pallets in the pallet racks to place them where the layers of packages will be made. 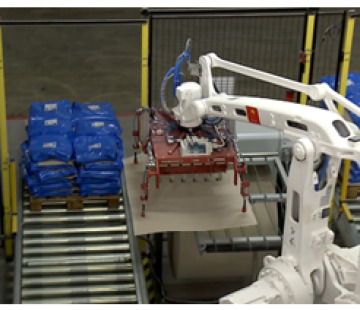 ► Between each floor, the robot may need to place a tie-sheet such as STABULON® to ensure the stability of the pallet. The robot then comes to use in a stack of interlayer sheets stacked in the security zone. Operator has to enter the security zone every time he needs to check the quantity of interlayer sheets or add more. Other option - EXCALIBUR® tie-sheet cutter which will transform a roll of tie-sheet such as STABULON® info a customized size interlayer sheets, posed on the pallet. The robots are flexible; the palletizers are fast. Each of the two types of palletizers has its advantages. 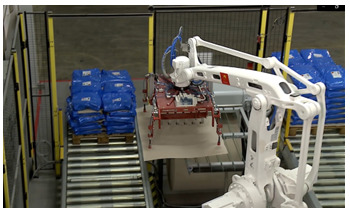 Palletizing robots are often less expensive than layered palletizers. They can be a good solution for an industy to make a first step into the world of automation. Quite flexible, they can serve several lines of packaging at a time, and palletize several dimensions of pallets at the same time. However, as they have several roles to play (taking parcels, taking tabs, removing pallets etc. ), the cycle of palletizing robots is limited. Moreover, if the shape and nature of objects to handle vary, the gripper will be more and more complex. Its cost can represent a significant part of the global cost of the robotic cell. Because they handle entire layers of packages at once, the biggest advantage of layered palletizers is their rate. Some models of palletizers can palletize up to 10 layers per minute. Very reliable, they offer optimum care in handling products. Today, the boundaries between types of palletizers are thin. Recently, manufacturers of palletizers and integrators have begun to combine technologies to make the best of both types. For example, we see more and more palletizing lines equipped with robots, with very sophisticated grippers, to take whole layers of parcels prepared in advance. As for the cobots (collaborative robots), they are also entering the family of palletizers. There is no doubt that in the nearest future, many innovations will change the world of palletization as we know it today. Sinopack Expo 2019 – Guangzhou, China - 4 - 6 of March 2019, March 6th the last day of Sinopack expo in Guangzhou, China.